One of the strength of our company is to make mobile apps for restaurants. As a restaurant owner, the benefit of having a mobile app we offer for your restaurant can be immense. The user can browse all your menus accompanied with enticing pictures of the food on the go. They can place order and make payment through the app. Once the users have your app on their phones, they are more likely to become returned customers for your business. 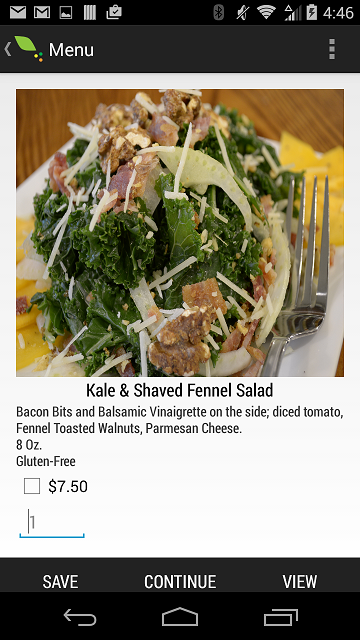 Below is an android app we made for Seattle local restaurant In-Season Fresh Take Away. The user of the app can select the dishes, make payment and submit order to the restaurant. The restaurant will receive the order through email notification. The user can also choose to receive receipt through email. This app is designed, developed and copy-righted by Pacific Technology and Resources LLC. If you are interested in what we offer, please contact us for special quote.